My boys (ages 5 and 7) are HUGE fans of Cake Boss, so when they saw Buddy make an aquarium cake, they immediately asked me to make one for their birthdays. So, this is my version of one. 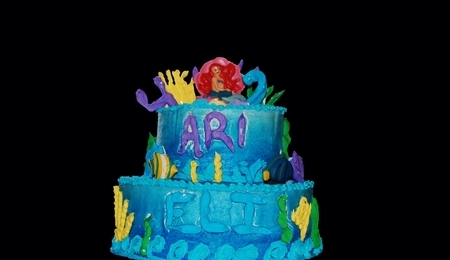 I used a 12" round cake, cut a hole in the middle for the fish bowl, used my airbrush for the coloring. I melted white and colored chocolate candy in the fish and shell molds and made isomalt coral all around. It was a big hit at the party and the boys loved it! !